“Inspiration Bleu” is a piano lover’s delight. It’s a wonderful collection of some of the piano’s most beloved repertoire. 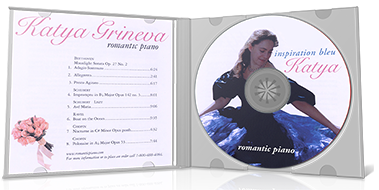 From Beethoven’s “Moonlight Sonata” to the Chopin’s enduring Ab Polonaise; every selection on this elegantly crafted album will enchant piano enthusiasts and music lovers alike. Katya Grineva delivers compelling performances by deftly crafting musical lines with the finesse of an master poet. Her touch emanates a rare warmth, uncommon in contemporary pianists and her interpretations are both delicate and powerful.